Litter box issues are sometimes medically-related, so be careful. If your male cat all of a sudden seems to be forsaking the litter box for other preferred spots, it can be a real headache. Cleaning up damp urine patches isn't fun, whether they're from your cat's marking habit or from his sudden rejection of the litter tray -- yikes. If your male cat is relieving himself outside of the box, urine spraying could be to blame, especially if he's not been neutered. If your fluff ball is of reproductive maturity, he may spray to "notify" female cats of his mating availability. 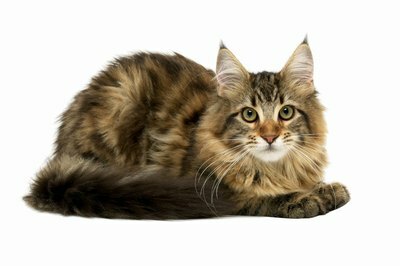 He also may mark spots of your home with urine as a way to compete with other cats who may also reside in your household. Urine marking is a territorial action with cats. Your cat may be saying to another, "Back off, buddy. This is my territory, and you better recognize that -- fast!" In many cases, getting your tomcat neutered will stop -- or at the very least reduce -- the spraying behavior, though it might take several weeks for the hormones to fully exit his body. When a cat flat out begins rejecting his litter box, it may be his way of expressing to you that he has a problem with it or something about it. Maybe the box is too tight and cramped and he doesn't feel comfortable going in there. Maybe the sides are too tall and it's hard for him to get inside. Perhaps he doesn't like the strong scent of the litter. Or maybe he just has a surface preference -- think smooth carpets and rugs. If the litter box is surrounded by a soft carpet and your pet prefers how that feels, it may explain why he's urinating directly outside of the box rather than in it! If your cat's litter box rejection is driving you batty, figure out what he doesn't like about the situation and change it promptly, whether you have to get a bigger box or find a fine-grained litter that has a softer, smoother feel. Some cats stop using the litter box as a result of extreme stress and anxiety. Perhaps your sweetie is feeling on-edge because of a big change in his life. Maybe you've relocated to a different apartment in a new city. Perhaps his favorite feline pal just passed away and he's feeling lonely and confused. Change is tough on cats, and their litter box behaviors are often very telling. A little time, extra TLC and attention may be all that your precious pet needs to get back on track, whether it comes to his feelings or his litter box use. If you suspect that your cat needs a helping hand, take him to the veterinarian and ask about possible anti-anxiety medicines for short-term use. Your cat also may be going to the bathroom in inappropriate spots because of a medical issue. The problem may be something he absolutely cannot control. Because of this possibility, get your poor kitty to the vet as soon as possible. A variety of different ailments are sometimes linked with urination problems, including feline interstitial cystitis, incontinence and liver disease.